Ipswich: like the continent, it's closer than you think. Rev up the Red Rover and let's roll right past the Orwell Crossing, leaning left afore the bridge to go down the A1189. Maths fact: 1189 is not prime, being the product of 29 and 41. There, we've all learned something. Past the airport, past future Ikea, over the mini roundabout and pull over. 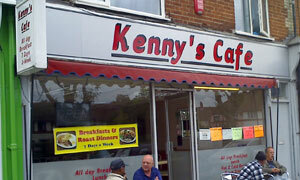 Nicked a last-gasp parking space and it's a short saunter into number 348, the not at all hard to find Kenny's Cafe, "breakfasts and roast dinners 7 days a week". Not my manor, this part of The 'Swich, though I believe this is the former Portman Cafe. To further confuse, the laminated table menus are plastered with "The Full Monty", also being the name of the fill-yer-plate monster breakfast. Various wimpy options are also available numbered 1 to 5 if you care for your arteries. I took it as a good omen that Trapped by Col Abrams was playing on the radio as I ordered from the other handwritten options pinned to the counter: for me, the quintessentially English chicken curry and rice. Oh, and chips. That's very nearly your model eatwell plate, nicely balanced with an ice cold Dr Pepper. My spicy protein starchfest arrives on a big ol' plate and is guiltily gutfillingly good. As we're tucking in, Grenvyle drops the P-bomb: he'll v. shortly be riding off into the sunset and Picking Up His Pension. Countdown is on for his last few weeks of gainful employment. Like that Live Aid song by The Cars, Who's Gonna Drive Us Home? Kenny, who may or may not be related to Jeff or Jack, has his walls hung with mirrors and the odd exotic photo of faraway Venice. There's that community caff feel much like the Mega Byte, a place populated by blokes who work with their hands. Time for us moisturised men to move along and mosey into the nearby Cottage Loaf Bakery for dessert -- that fresh cream-filled Eccles Cake was divine. If it was a car -- Vauxhall Combo. If they were passing by -- Larry Lamb.